This spring, Writing for Peace looks at gun violence, as well as violence against women and other issues of women’s equality. The other day, the building where I was working was on lockout. There was a shooter in the office park and police had sealed off the area. They were pursuing a person of interest in the incident, an alleged gunman who was still at large and presumed armed and dangerous. The targeted victim survived the attack and was transported to the hospital with unknown injuries. Gunman, at large, armed and dangerous. Considered alone, each of these words and phrases has a very different meaning from when they are strung together to describe yet another event of violence in our communities. Such words, common enough on their own, are now a part of a growing lexicon of carnage, a new vocabulary of violence. I, for one, am sick and tired of it. I’m sickened by the loss, the grief, the terror, the waste…sickened by randomness, senselessness, and injustice. And I’m tired of trying to use our everyday language to give these vicious acts some sort of meaning. When did “lockout” come to mean more than forgetting my keys, and a “shooter” more than a short glass full of strong stuff? Why are victims “targets?” Targets are for archery practice and marketing plans and weight-loss goals, not the end results of violent actions. And I’d much rather leave high-speed chases to the Indy 500 and abductions to aliens. And when did a suspect become a “person of interest?” This sounds more like speed dating to me. I can’t help but wonder if this is a case of art imitating life or life imitating art…in this case, a TV drama of the same name. I do understand, of course, why we need to use such language carefully, including the word “alleged.” The right to a presumption of innocence in the United States is not shared in all courtrooms around the world. Wait a minute…all the circumstances surrounding this tragedy are yet to be known fully, but the shootings themselves aren’t “alleged”—they happened. That’s one reason why I’m sick and tired and saddened that a beautiful, powerful, well-respected, and well-loved language is being corrupted to include this new vocabulary of violence. I’d much rather think of an “attack” as coming from the flu, and of a “shot” as something to protect me from it. That’s a lexicon I can live with. Andrea Doray is a writer, media watcher, and careful consumer of the news. She serves as a board member for Writing for Peace and is a contributing editor on its international journal, DoveTales. 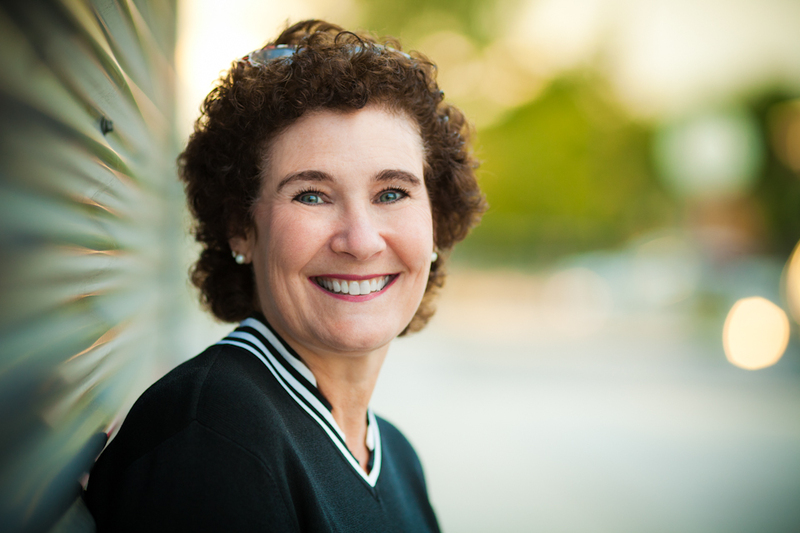 Learn more about Andrea W. Doray here. 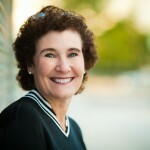 Writing for Peace is pleased to welcome Mary Carroll-Hackett to our Advisory Panel. Mary is an award-winning author, poet, editor, and educator. Jonas Salk said “Our greatest responsibility is to be good ancestors.” I heard my mama say this when I was a child, and it, from that moment, changed and shaped the way I saw and moved through the world. As a parent and as an educator, to me, there is no greater gift nor more sacred trust than to honor the gifts given me by those who came before by doing whatever I can to help the young ones following behind us, Writing for Peace, particularly for me with their work with young people, will be the way we heal this world, heal and love each other. I’m humbled and honored to be a part of it. 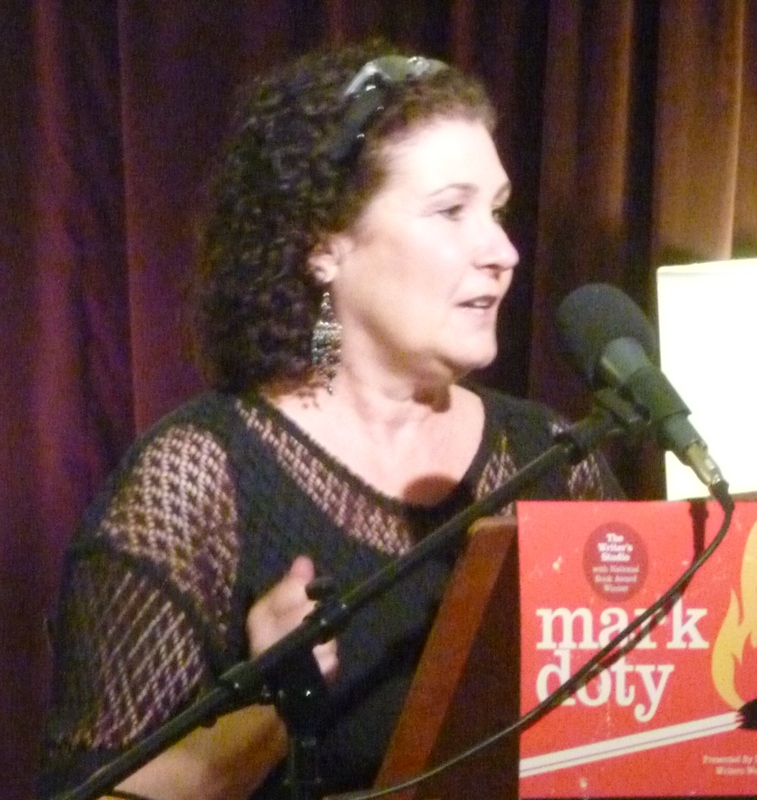 Mary Carroll-Hackett earned an MFA in Literature and Writing from Bennington College in June 2003. Her poetry and fiction have appeared in more than a hundred journals including Carolina Quarterly, Clackamas Literary Review, Pedestal Magazine, The Potomac, Reed, Superstition Review, Drunken Boat and The Prose-Poem Project, among others. Her awards include being named a North Carolina Blumenthal Writer and winner of the Willamette Award for Fiction. She had an O Henry Recommended recognition for her story “Placing,” and her collection of poems, The Real Politics of Lipstick, won the 2010 annual poetry competition by Slipstream. Her chapbook Animal Soul, is forthcoming this year from Kattywompus Press. She has taught writing for nearly twenty years, and in 2003, founded the Creative Writing programs, undergraduate and graduate, at Longwood University in Farmville, VA, serving as Program Director of those programs until Fall 2011. Mary Carroll-Hackett invites all young writers to join her students in posting and discussing current event articles on her open Facebook page, MCH-What’s Going On?. Learn more about Mary Carroll-Hackett’s work here. Kellan McTague, a junior at Fort Collins High School, shared that his grandfather had been a veteran of the Korean War. “Your grandfather saved my life,” said Devine. 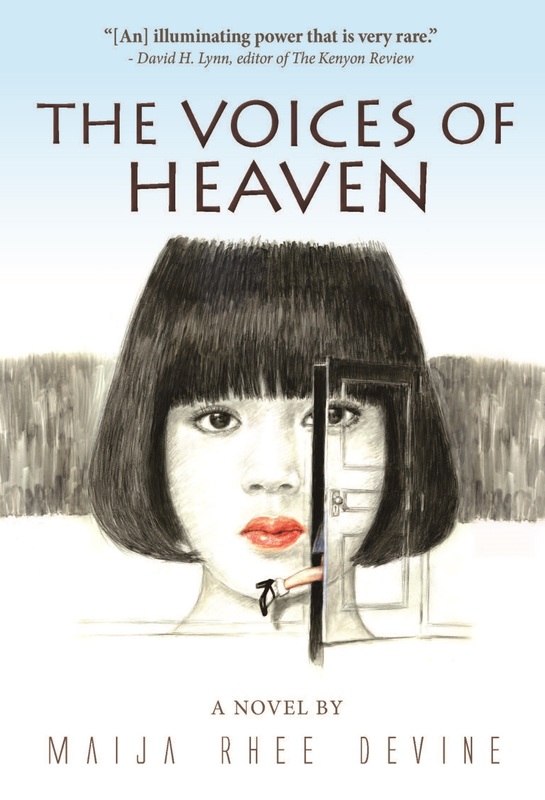 Author, poet, and Writing for Peace Adviser, Maija Rhee Devine, visited Fort Collins High School last week to read from her debut novel, Voices of Heaven. 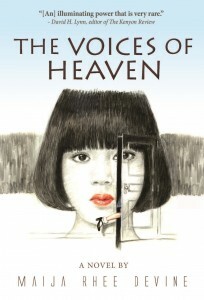 The novel was first written as a memoir about her experiences as a young girl during the Korean War. As the North Korean and Chinese armies invaded, Devine’s family fled along with thousands of others through snow and freezing temperatures, carrying their possessions in bags on their heads. Some men, she said, balanced mattresses on their heads in hopes that the extra padding would protect them from flying bullets. Students in Mitch Schneider’s language arts classes listened with rapt attention as Devine described how her mother would cover her eyes when they came upon bombing victims, or as people beside them were struck by sniper bullets. They boarded a boxcar without windows or seats where desperate men clung to the outside of the cars, until they froze and fell to their deaths. Fort Collins High School sophomore, Margarita Gutierrez, and visiting author, Maija Rhee Devine. Devine explained the Confucian culture that made boys necessary to families, not only for the security of elderly parents, but to perform the ceremonial feasts that ensured the well-being of three generations of ancestors in the afterlife. A man and wife who were unable to produce a male heir would commonly secure a mistress, either maintaining a second household, or bringing her into the home. This was the case in her family, when fifteen harmonious years of marriage failed to produce a male heir. 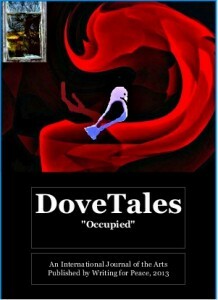 Her novel opens with her family preparing for the arrival of the new mistress amid rumors of war. 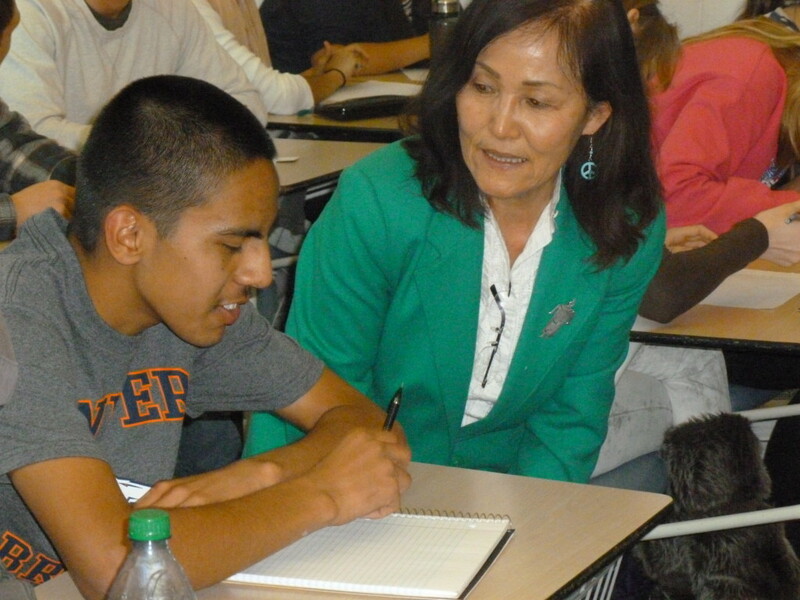 Fort Collins High School student, Erik Garcia Arellano, and visiting author, Maija Rhee Devine. Devine said the process to transform her memoir into a novel had taken ten years, but ultimately had freed her to explore voices of other characters within the story. She read about the arrival of the new mistress from her own perspective as a little girl, as well as her mother’s, father’s, and the mistress herself. Devine challenged Schneider’s students to think back to an emotional event in their own lives and write about it in the voice of another character. Maija Rhee Devine, a Korean-born writer whose fiction, non-fiction, and poetry have appeared in Michigan Quarterly Review, Boulevard, North American Review, and The Kenyon Review, and in various anthologies, holds a B.A. in English from Sogang University in Seoul, and an M.A. in English from St. Louis University. Writing honors include an NEA grant and nominations to Pushcart Prize and O. Henry Awards. 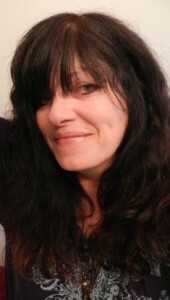 Maija Rhee Devine is a member of the Writing for Peace Advisory Panel. Learn more about Maija here. Our 2013 Young Writers Contest closed on March 1st with 106 entries from 21 different countries. We will announce the decisions of judges William Haywood Henderson (fiction), Phyllis Barber (nonfiction), and Michael J. Henry (poetry) on May 1st, 2013. Every participating young writer will receive a certificate of participation, which will be mailed this month. The 2014 Young Writers Contest Guidelines will be posted on June 1st, 2013. This entry was posted in Board Contributors, Gun Violence and tagged Advisors, Andrea Doray, Fort Collins High School, Gun control, Gun violence, Guns, Maija Rhee Devine, Mary Carroll-Hackett, MCH-What's Goin On?. Bookmark the permalink.